Welcome to Baden-Baden’s municipal recreational forest and to the North/Central Black Forest area of outstanding beauty (“Naturpark Schwarzwald Mitte/Nord”). The walkers’ car park at Jagdhäuser Wald is on the edge of the nature conservation areacalled “Markbach und Jagdhäuser Wald”, a lovely location for pleasant walks through deciduous forests rich in vegetation and picturesque meadow orchards. The nature conservation area gives protection to a characteristic landscape of foothills where loess sediments dominate the soil. This fertile soil and the favourable climatic conditions of the slopes are ideal for agriculture, with wine and fruit growing predominating, as well as some arable farming. The resulting land use - small, mosaic-like plots of land – are home to a rich variety of flora and fauna. This a particularly attractive area for walkers, complemented by the uninterrupted view of the Rhine plain from the ‘Dragonerdenkmal’, a war memorial. The loess soil is evident in the forests in their rich layer of ground vegetation, which is particularly impressive in spring when the irresistible scent of wild garlic fills the air. Another distinctive feature are the deep furrows in the loess soil which crisscross the forest floor. The best way to discover the forests and meadow orchards of the nature conservation area is on the ‘Sängerrundweg’ circular route. Fremersberg mountain, which has some of the nicest views in Baden-Baden, is also reachable from Jagdhäuser Wald trailhead. 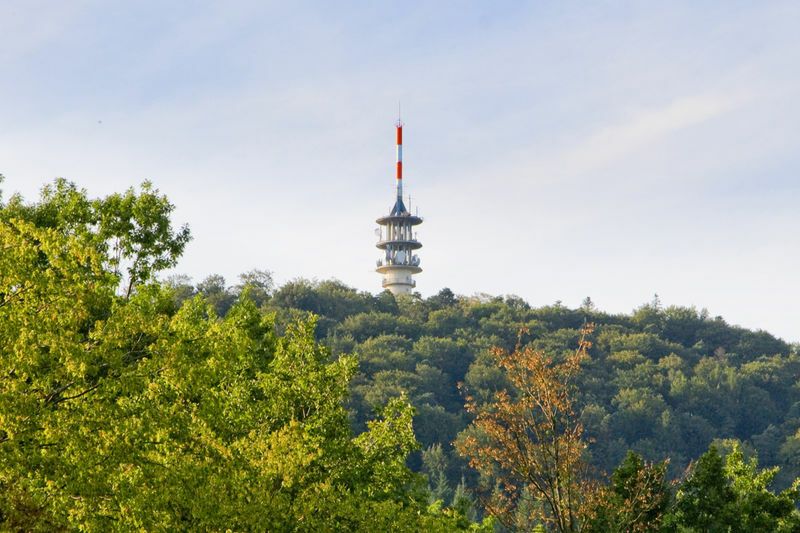 From the top you look down on the verdant green of Baden-Baden with its backdrop of peaks – Battert, Merkur and Yburg. You’ll often get a view of the complete western flank of the Rhine Valley, from Grand Ballon, the highest peak in the Vosges Mountains, in the south, to Kalmit, the highest mountain in the Palatinate Forest, in the north. Up Fremersberg: 8.5 km, total ascent 370 m, steep in parts: via Dragonerdenkmal (war memorial) – Kälbelberg – Fremersberg. Descent via Windener Tor to Winden and then to Dragonerdenkmal (war memorial). There is a restaurant at the summit of Fremersberg. To Baden-Baden: 7.5 km, total ascent 250 m, easy: via Dragonerdenkmal (war memorial) – Pulverstein (crags) – Katzenstein (crags) to Unterer Waldsee (small lake). Then continue via Pulverstein (crags) and Unterer Waldsee (lake) to the Stourdzakapelle (chapel) and descend to the Kurhaus in Baden-Baden. Return on the number 205 bus. To the Sängerrundweg circular route: 10.5 km, total ascent 300 m. The circular route is accessed via the path to the Dragonerdenkmal (war memorial). The Sängerrundweg takes you around the village of Winden: Dragoner Denkmal (war memorial) – Schleifweg (path) – Grotte (grotto) – Eck – Hohbach (stream) – Markbach (stream) – Dragoner-Denkmal (war memorial).